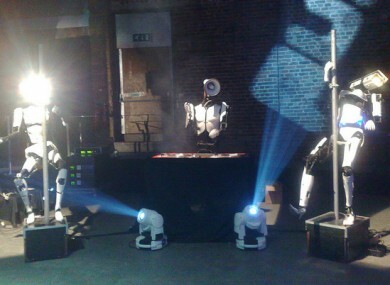 The pole-dancing robots featured at another exhibition two years ago. EVERYONE LOVES a good robot, one that prevails over evil like the heroic scrap metal heaps featured in WALL-E, Short Circuit and I, Robot. However it seems that real life technology isn’t interested in the robots that save the world, and are in fact more concerned with the robots who can perform other ‘activities’ such as pole-dancing. The pole-dancing robots are just two of the wacky inventions that has turned heads at the world’s biggest high-tech fair, CeBIT, which opened in Hanover Germany today. The gyrating robot, that has a CCTV camera-shaped head, dances suggestively to music provided by a DJ robot, who moves in time to the beat of the song. Not to mention that this robot could soon put professional pole dancers out of business, you have to ask is this really what technology was developed for? The pole-dancing robot is just the latest in a series of strange and somewhat unsettling robots. In 2008, Thomas and Janet, the kissing robots, were unveiled to the world. Their first PDA took place during a robotic performance of several scenes of Phantom of the Opera at National Taiwan University of Science and Technology. A very sweet moment of affection between two machines. In 2009, the Panasonic robot at the Gitex Exhibition in Dubai smooth talked the ladies while singing and dancing. His movements are so seamless you could almost mistake him as a sleazy guy chatting up a girl at the bar. Professor Hiroshi Ishiguro of Osaka University has taken the idea of living forever to a whole new level. The roboticist is now known as ‘The Man Who Made a Copy of Himself,’ after building a robot replica of himself. The robot was made using a mold of Ishiguro’s own body and matches him down to his voice, glasses and even has his own hair embedded in the humanoid’s skull. In a world where healthy living is so important, even robots are taking up physical activity. It seems Japanese robots are even taking to their bikes to keep fit. Email “Pole-dancing, kissing, bicycling automatons: 6 strange robots”. Feedback on “Pole-dancing, kissing, bicycling automatons: 6 strange robots”.